Since the discovery of ionizing radiation in 1895, women have played an important role in learning about its uses and dangers. However, throughout the early to mid-20th century, many of these women faced significant obstacles in their research due to their gender and other factors. Perhaps one of the most striking examples of this is Lise Meitner, an Austrian physicist who was part of the team that discovered and explained nuclear fission. Meitner, who was the second woman to obtain her doctorate degree from the University of Vienna, began a collaboration with German chemist Otto Hahn that lasted more than 30 years. Together, they discovered the isotope of protactinium, conducted investigations on beta-rays, and discovered an artificially active uranium isotope. In 1926, they began research on nuclear fission, but their work together was interrupted when Hitler came to power. Meitner was born to a Jewish family, and she had to sneak across the Dutch border in 1938 to avoid persecution. She continued her research in Stockholm, Sweden, working with Hahn through correspondence. In 1944, the Royal Swedish Academy of Sciences awarded the Nobel Prize for Chemistry to Otto Hahn for the discovery of nuclear fission. While he had found the evidence for the phenomenon, Meitner and her nephew Otto Frisch were the ones who ultimately identified it. Yet they did not receive any credit—probably because the Nobel committee did not understand her contributions since she was in another country when the work was completed. Martinez, Nicole. Contributions from Women to the Radiation Sciences: A Brief History. Health Physics Society:376-381; 2017. 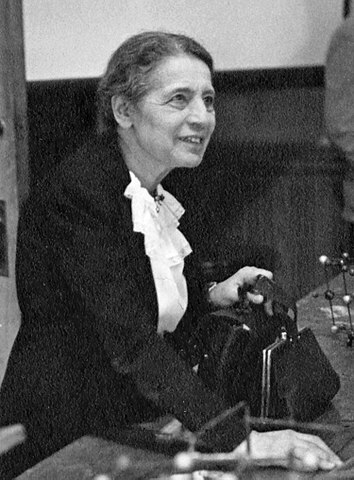 Austrian Physicist Lise Meitner contributed to the discoveries of the isotope of protactinium and an artificially active uranium isotope. Meitner did not receive credit for her work when German chemist Otto Hahn received the Nobel Prize for Chemistry.